After making pheasant stock earlier in the week, I had a hankering for making a nice rich risotto with it. It is not exactly the season for a hearty risotto paired with Nebbiolo, but some times you just want. After a quick trip to Chelsea market, it was time for boquerones, bread, and Clos Roche Blanche 2008 Sauvignon No. 2 followed by Porcini and Cremini mushroom risotto and Fantino 2006 IGT Rosso dei Dardi Nebbiolo. 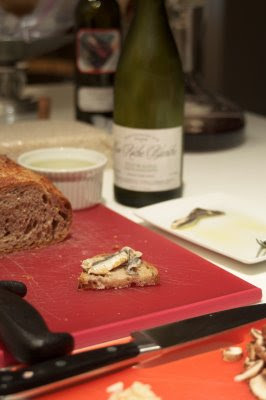 The boquerones were sweet and subtle and a perfect pairing with the Clos Roche Blanche 2008 Sauvignon No. 2 which was full of minerals, grapefruits and lemons. 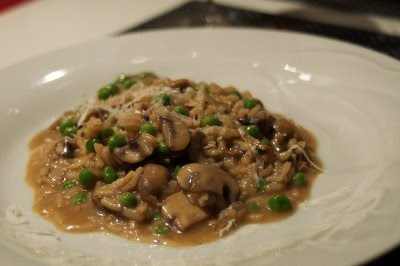 I made the risotto using dried Porcini mushroom (also using the strained water from the soaking liquid), fresh Cremini mushrooms, Arborio rice, onion, garlic, frozen peas, homemade pheasant stock. I finished the risotto with Presidente butter, 24 month aged Parmigniano Reggiano, and white truffle oil. What a rich, creamy, pungent warming dish and paired with the nebbiolo, it would be a fantastic rainy November dish. What can I say, I turned the air conditioning on and enjoyed the meal.